This tomato and egg curry is a fabulous Indian dinner recipe with a variety of uses. Use it as a main dish, served with a side dish of chapatis or rice, or serve it as one of several tasty Indian dishes for a larger meal or on a buffet. It’s a great dish for vegetarians (those who still eat eggs). And best of all, it’s quick, easy, healthy and delicious! Peel the onions and slice them thinly. Sauté the onions in the ghee (or oil) until soft but not browned. Add the ginger, cayenne, coriander, turmeric, cumin and salt and sauté for five minutes longer. Peel and dice the garlic and add it. Purée the tomatoes (you can do this in a food processor, blender or food mill or just mash them with a potato masher) and add them to the tomato mixture. Simmer uncovered about 20 minutes, stirring occasionally. Add the garam masala to the sauce and stir well. Cook for a couple of minutes. The eggs should have a thick coating of masala. Grind everything together in a coffee grinder or food processor. Keep it tightly sealed in the freezer for a few months worth of curries. You will find another recipe for garam masala, slightly different from this one, here. Before serving, garnish the dish with toasted slivered almonds if desired. Serve the egg curry recipe with chappatis, parathas and or rice pulao. It’s also wonderful as a an accompaniment to a vegetable dish in a vegetarian meal. The masala base for this dish can be made ahead and can even be frozen. 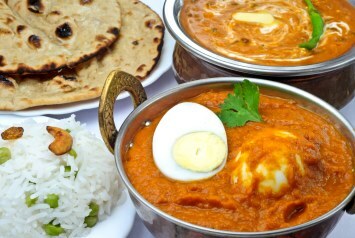 If you love this egg curry recipe, browse our other Indian recipes here.